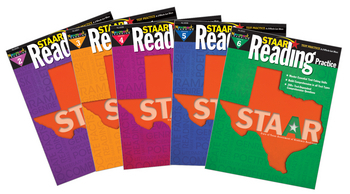 The STAAR Reading and Mathematics Practice Set for Grades 2-6 includes 10 Teacher Resource Books (5 Reading books and 5 Mathematics books) designed to prepare your students for success on the STAAR assessment. Grade-specific titles provide Texas students with the tools to succeed on the STAAR Reading and Mathematics assessments! Instruction, practice, assessment, and sample tests in each book. Reproducible.